You are here:Home Pipettes Good Pipetting Practice — Pipetting Techniques to Boost Your Performance. Recognize the risk associated with out-of-calibration pipettes and the role of routine pipette checks vs. professional pipette service. 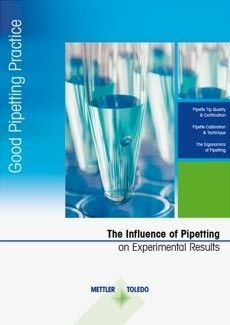 How can you profit from the principles of Good Pipetting Practice? If you have done a GPP seminar already, you can request a personalized GPP certificate. The following tips and tricks are a short excerpt of one of the many topics covered in our GPP seminars and elearnings. Here are some very common pipetting technique errors and how to avoid them. The correct tip immersion depth can improve accuracy by up to 5%. The tip should be immersed between 1-2 mm for micro-volume pipettes and up to 3-6 mm for normal-range pipettes, depending on the tip size. If the tip is immersed too far, the volume of gas in the tip is compressed, causing too much liquid to be aspirated. The immersion angle of your pipette tip in the sample should be as near to vertical as possible and should not deviate more than 20 degrees from vertical. A more horizontal angle causes too much liquid to be drawn into the tip, resulting in inaccurate aspiration. For example, at an angle of 30 degrees to vertical, up to 0.7% too much liquid can be aspirated. Greater accuracy and sample-to-sample reproducibility can be achieved by ensuring that the last remaining droplet dispenses fully and does not adhere to the tip end. For most applications, dispensing with the end of the tip resting against the vessel wall is recommended as it reduces or eliminates the amount of sample remaining in the tip. This technique can increase accuracy by 1% or more. Dispensing liquid from a pipette leaves a coating of the liquid on the tip, making the expelled volume slightly less than it should be. Pre-rinsing a new tip at least twice with the liquid about to be used will condition the inside of the tip. Use a consistent pipetting rhythm from sample to sample. Avoid hurrying or rapid operation and get into a rhythm for each step in the pipetting cycle. These five simple techniques alone can have a big impact on your results, but there are a few more to consider. 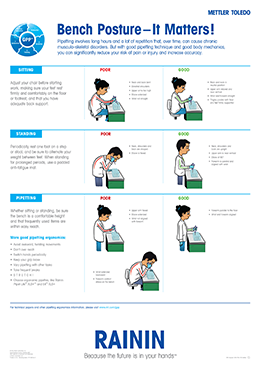 As part of our Good Pipetting Practice™ program, METTLER TOLEDO has developed a quick Risk Check to help you assess your personal pipetting risks and learn how to reduce them. You'll get a personalized Risk Analysis Report that you can view and print online. GPP is all about helping you learn to improve your pipetting accuracy and recognize when your pipettes are not working properly. It will just take a few minutes to assess your pipetting risks and get some useful hints on reducing these risks. Did you know that you can request a certificate if you have taken a GPP seminar? Click the link and follow the instructions to get your own, personalized GPP training certificate. Access pipetting brochures and other pipetting knowledge material around Good Pipetting Practice. Stand up and Stretch! 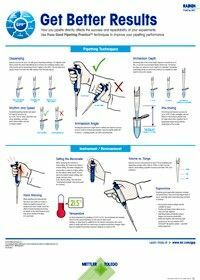 Order your free "Hands, Arms and Shoulders" poster and improve your pipetting ergonomics. Get better results in the lab with good pipetting techniques from Rainin. Bench Posture – It Matters! Rainin's Bench Posture poster covers all topics about the right posture to prevent chronic muscular-skeletal disorders for those working in the lab. Get specific techniques on how to decontaminate pipettes, with distinct cleansers for different sample types. Confidently pipette viscous, high vapor pressure, foaming and other types of challenging liquids. Includes instructions for Reverse Pipetting. The use of pipettes to transfer liquids is a daily activity in most life science research labs. Therefore the impact on research results is equally substantial. Our Pipetting Toolbox for Life Sciences guides you through pipette & tip selection and calibration, as well as pipetting technique.